Would they be as good as the old made-in-England? I doubt it. If l had my way l wouldn't be getting the usual ltalian and Scottish offerings, i'd get the specialist luxury knitwear of utmost decadence. For the ultimate check these bad boys out! Qivuick is extreme luxury wool. I don't know where these gems are made, but they sure are luxury and eye popping, and l bet they don't use plastic buttons like the `so called' highend makers such as Brunello Cucinelli. 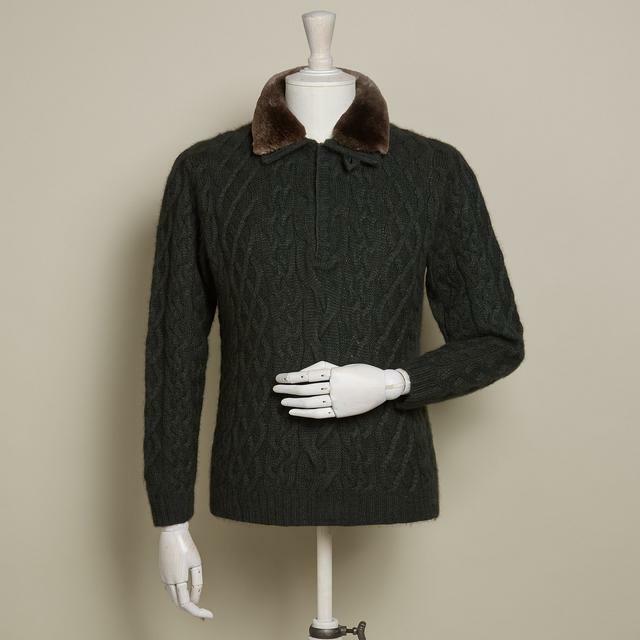 Imagine how good it would be to have a beaver collar on your knitwear, it would be amazing and it would tell people you don't muck about and you do things for real. These are just dreams for now, but all we need is just a few of these and we have a great wardrobe of amazing knitwear classics. The finest cashmere intarsia sweaters ever made. One even has a mink fur collar. Pringle of Scotland sounds so nice, except their cashmere jumpers can be made in China. Notice how they try to make it sound good by mentioning Inner Mongolia because this area has the best cashmere, but cashmere sourced from there v's manufacturing from there are two entirely different things. Maybe Johnston of Elgin doesn't make their jumpers anymore? Some 90's wool Pringle were also made in Thailand and Hong Kong. I also see Lyle and Scott cotton jumpers are made in India, and some jumpers are now 50% acrylic and 50% wool. I saw some wonderful rare gems for sale the other day. All went for good prices. An 80's and a 70's. Such a great find. Amazing to think such things are still around unworn. I wonder where they find these things. As for me...i've got a big daddy....one of the biggest daddies of all, a daddy almost as rare as hens teeth. I'll talk about it another day. I am still on a mission of hunting down BIG daddies, and I won't talk about it until later. The Shooman , just received two hand knit burley, hefty 100% yak wool roll necks from Nepal. @Truth very many and very amazing. 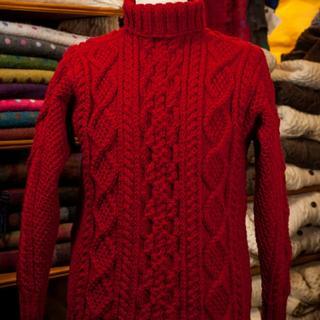 You always know what to do when it comes to knitwear. As for me....I have bought some BIG daddies. 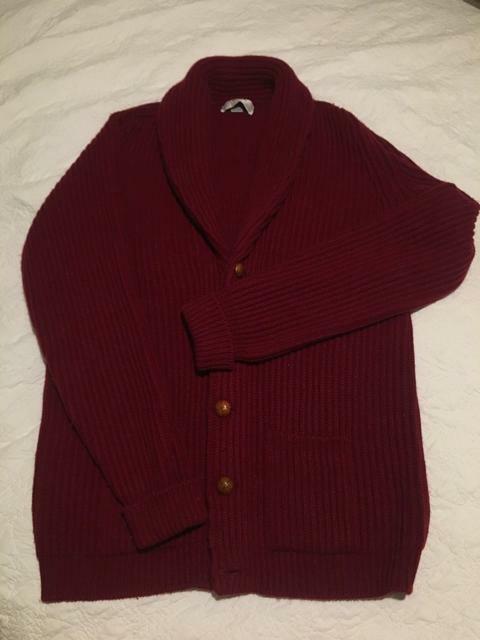 Two 6 Ply Ballantyne cardigans. Rare as hens teeth and more rare than gold. Big bucks in the old days, and not cheap as vintage either. It is too long for me so l am going to have it altered. I am going to get 2 inches taken off the bottom and have the pockets moved up. I'll also get some length taken off the sleeve. 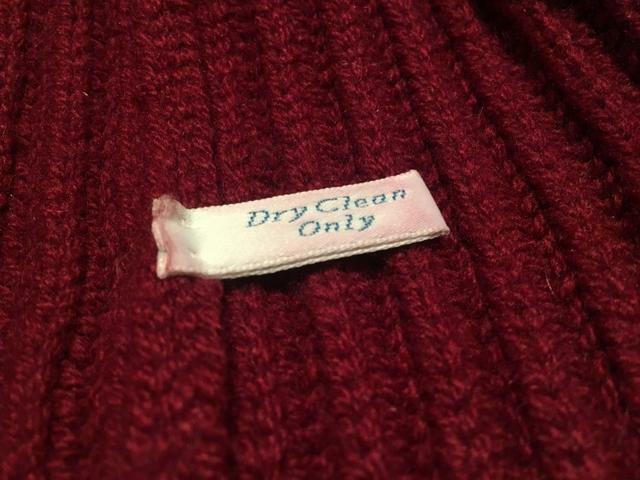 It will be well worth it, and only the best knitwear alteration specialists will be working on it. They have worked on complicated 6 ply Ballantyne knits before. They will unravel the bottom of the cardigan and sleeves and reknit the ends. I always wanted the big daddies of BIG daddies, and this is the only way to make it happen. I'll have a BIG daddy for life. 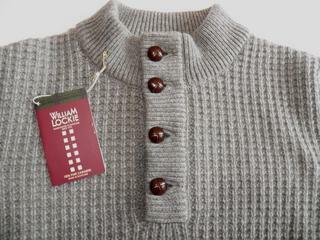 I also notice the high density 6 ply Cardigans are not as heavy and thick as my William Lockie despite the Lockie not being as densely knitted. This leads me to believe that my Lockie 6 ply is really a Lockie 12 ply. Originally the seller advertised two identicle jumpers as mine...one was sold as a 6 ply and the other as a 12 ply. I think the seller made a mistake and mislabeled my Lockie as a 6 ply instead of a 12 ply. NOne-the-less...despite it being thicker and heavier than a big daddy aran, it is still not warm enough in winter. Even if l wear a thermal underlay, a 2 ply ballantyne cashmere jumper as a second underlay, a 6ply over that with a 12 ply over that, it is still not warm enough in winter for me. I only get warm enough if l have a thick coat to go over it all. See, l feel the cold in winter and only want the thickest 12 ply knitwear and the heaviest coats in future. I am also going to get HEAVY tweed trousers to wear over my long Johns. I also wear rare 4 ply alpaca socks with shell cordovan shoos on the coldest days. You are a brave man to have them unraveled. Interesting about the possible mistake in sending you the 12 ply. Man, that is a lot of wool to be warm! Last week it was -30 C at night and I had a 200 gsm merino base layer. A Patagonia synthetic R1 and a 4 ply Dachstein high button neck with a soft-shell on top and I was toasty. Where do your Arans rank in warmth for you? Have you ever thought of getting a Dale of Norway/Icewear/Musto/Harkila with a windproof liner? That liner also adds added warmth. I've a few Dales and a Harkila and they have a big bump in warmth. Makes a good mid or outer layer. Decidedly more country and casual so maybe not what you would wear though. Shooey - in winter you need to get back on the grog - rum, whisky etc will warm you up. You can go back to all pure in summer. You are a brave man to have them unraveled. I get a good feeling about it and the reviews of the place is good. The arans don't compare in warmth with the thicker cashmere jumpers. Wool just doesn't do the job for me when it is winter. If it is not too cold in winter l go a thermal merino then a ballantyne 2 ply cashmere jumper then an aran that covers it underneath, and that can get me by. But when it gets really cold (10 degrees C) i'll layer multiple high ply cashmere jumpers made in scotland. Yeah l have thought about it. 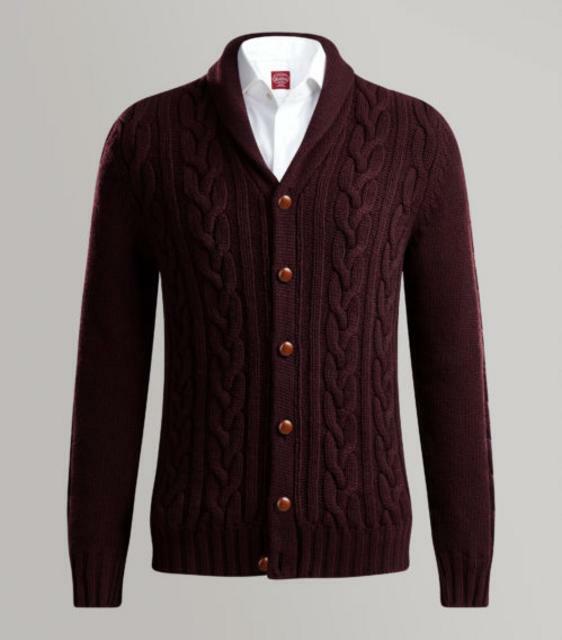 I want to get multiple 12 ply cardigans first. I really love my extra thick Lockie, it is my favourite jumper actually. The thicker the better for me. Did you ever order anything from Omaille, The Shooman ? Yes, l ordered the following about 12 months ago. Very good detailing in the jumpers. I do plan to get turtlenecks also in a medium natural blue and a moss green, and l might get a couple of crewnecks and cardigans in the future. But really, the ultimate luxury knitwear is good scottish cashmere, it's machine knitted and consequently more dense, and it's also softer. 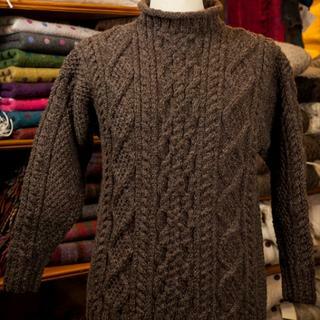 Those Omaille are coarse jumpers and completely the opposite of cashmere because they are traditional Irish knitwear, but it adds to the delightful character. None-the-less I wouldn't want to wear such coarse knitwear all the time. Those Omailles are works of art. So I wore one of the yak wool roll necks today. Yak is whack. It has been tested to be up to 40% warmer than merino and I'll attest to it having upped the warmth factor. I'd put it between my Dachstein wool jumper and top end Arans and other fisherman type sweaters like Devold. The Dachstein is 3 pounds of boiled, dense knit 4-ply wool so not much compares. It was -6 C this morning and I did not even button up my jacket. Decent wind resistance because of its dense knit. I was comfortable wearing it at alone at -1 outside for extended periods. Was comfortable indoors and did not reach "too warm" status with he central heating. I think bison is next. That is a fantastic post @Truth. Yes, now l see it is 3 pounds....even heavier than my supposed Lockie 8 gauge 12 ply weighing in at 2.3 pounds. Truth, l am really pumped up about getting a bunch of stuff from Dachstein for next winter. Hey @Truth thanks for educating me on what's what in manly knitwear. Btw, what is bison?....is it fat?...is it manly? Late edit: check out these super heavy weights. 4 pound. My William Lockie is twice as thick and much heavier than this Ballantyne 6 ply (immediately below), but not quite as dense. It further leads me to believe that my lockie is actually a 12 ply. My Lockie 6 ply that was identicle to the one sold as a 12 ply. My Lockie 5 gauge 6 ply has a bit of meat on it's bones, but it is not that beefy and heavy. However my Lockie above is a serious piece of cashmere...plenty of meat on it's bones....just how l like it. That is where I get my Dachstein from Shooey. Sweaters, mitts, gloves. Nice guy to deal with. Bison = similar to a buffalo. The soft under hairs are used. Most often blended with other wool, alpaca. I've never seen a straight-up all bison fibre sweater. This outfit does MTM jumpers. $425 USD. That is where I get my Dachstein from Shooey. Sweaters, mitts, gloves. Yeah, i'm definitely thinking about gloves and sweaters and head knitwear and definitely those super heavy 4 ply socks. 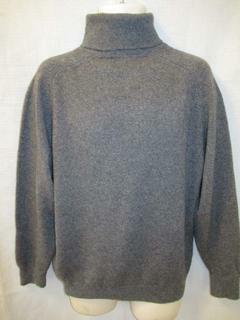 btw, l got me a Braemer cashmere turtleneck this arvo. 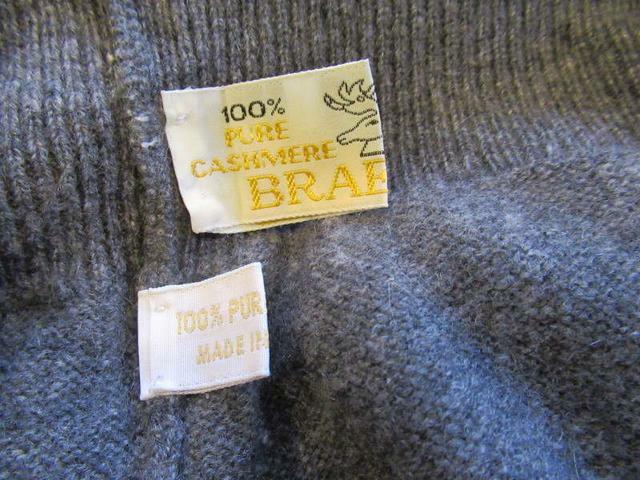 Have always wanted vintage cashmere from Braemer, so l am delighted with my purchase. I am LOVING the last few days...nice and cool and a great excuse to rug up in top cashmere. I even have thick cords and shell cordovan shoos on today and it is right up my alley. Would be nice to live in Scotland or down the bottom of the south island of NZ where the summers are far cooler and the wind blows hard. I really don't like the hot summers in Melbourne, l loath them actually. Not looking forward to the coming months because l know how hard it gets, but northern Queensland and other tropical areas are incredibly humid all the time, it would be a nightmare living there where people wear thongs and summer clothing all the time because it is so sticky and hot. Urk! Dry heat is o.k, but humid weather is the total pits. Would be great to move down the the south pole in summer....would be a good chance to wear fat boy with meat on it's bones (6 ply knitwear or an aran). I wish there were more roll neck/mock neck/polo neck/funnel neck out there in vintage and new. I don't need/like huge turtlenecks as I have no neck! The gloves and mitts are great. You might want to choose the lower ply gloves. I've got the 4-ply and I can wear them alone in -30 C. The 4-ply heavy-duty mitts have a pre-curved palm which is a nice touch. Also be aware the the knit hats, toques as we call them here, have a point on the top. I don't like them for that reason. The 4-ply socks are unreal in their warmth. Almost like thin Russian valenki felt boots. They can be a touch scratchy to some people on bare skin. I don't find that myself. But I often go barefoot in my shearling lined winter boots. Thruth , I appreciate you are the Lord of your manor and probably live alone in a country of your own, but -30 C. Why? Thinking of that makes we weep. The Shooman , your internal thermostat could do with a tweak as that is a lot of wool (in Australia for that matter) to be shod in, even for the likes of Antartica. @Truth Definitely will get the low ply gloves, nothing worse than gloves that are too hot. Sounds a bit weird about the pointy toques so lwill be avoiding that. 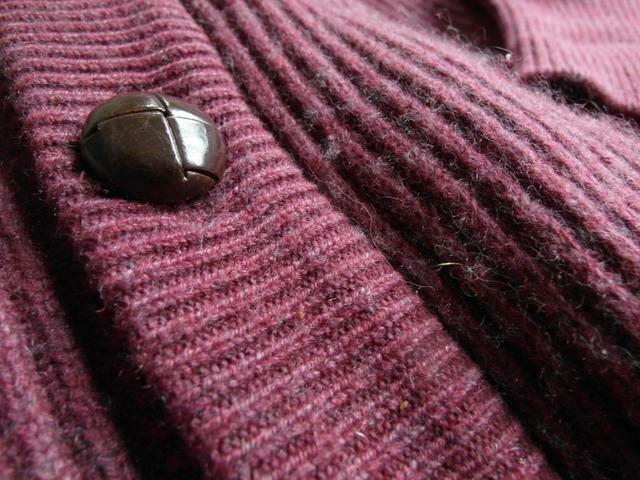 Thanks Truth for inspiring me to `go fat' (get beefy knitwear). 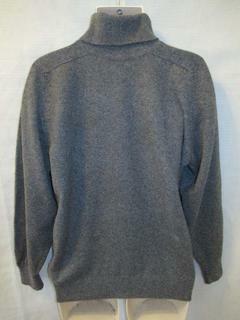 And yes, rollnecks etc are the tops, they look good, are snug and keep the cold from going down my neck. QuandoDio I have felt the cold for about 5 years now. I am not fussed. I know other guys that also feel the cold and need to rug up too. Buying all the cashmere knitwear was one of the best things l ever did. Cashmere is such a great wool for warmth...even lambswool isn't enough for warmth for me. Wasn't my choice. I had no intentions of living here. My wife is from here and we moved so she could be closer to her parents in their waning years. Seen some real rare items lately including a Gucci turtleneck made-in-Scotland and other rare beauties. Also saw this Pringle stunner! Gucci made-in-Scotland back when they were making better stuff. The Gucci stuff these days often has 30% polyester in it. He's certainly a fat boy, but i've seen way fatter. Check out these fat boys. Any idea of how old it is? WHOA!!! Good find. Unworn, and 1970's. 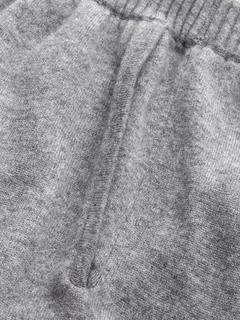 Recently l purchased a new pair Derek Rose cashmere tracksuit pants. Supposed to be very high quality. A real luxury. My old man had one of these from the 40's that I really dug as a kid as a kid in the 60's so when Nigel Cabourn did this limited run I figured what the hell. 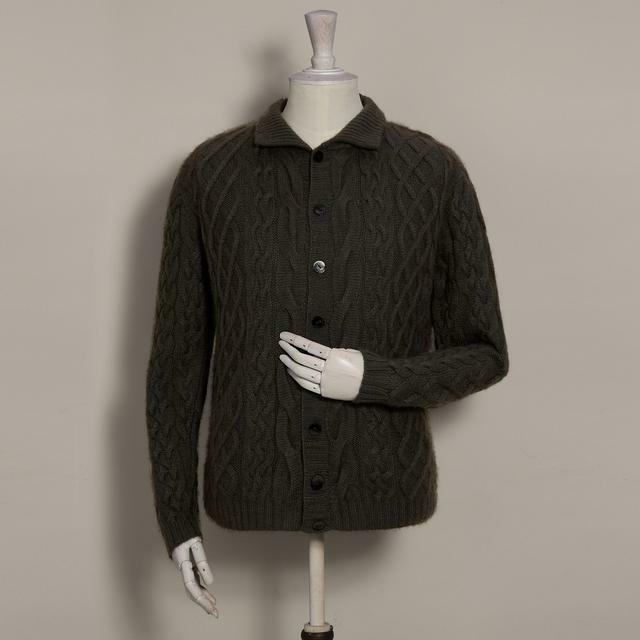 Its a wool/alpaca blend which was commonly used as insulation and liners in military cold weather clothing. Cut like a mechanic's jacket but with a full neck zip. Makes for a warm outer layer in normal winter temps and a good mid layer under a shell for more brutal temps. Not to everyone's taste but a nice workwear-style piece in my opinion. Very functional as everything Cabourn does is. Extremely well constructed as all of his pieces are. Made in Japan. Unlined like original jackets were. Big, soft fuzz and loft for insulation. 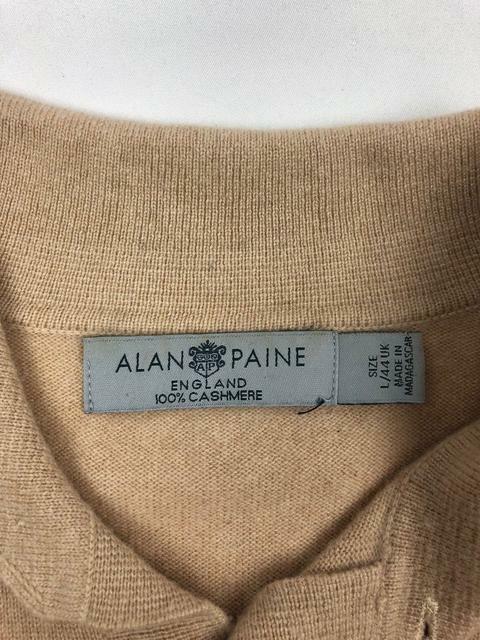 Snagged a beautiful vintage Alan Paine cashmere v neck in unworn mint condition. Have wanted a purple like this for years. I've got purple speckles and plum, but not the stunning purple like this. This is a real treat. Got a couple of rebadged Bosie jumpers for myself for Xmas, looking pretty great so far. Turns out they're knitted just up the road from my family's home but it doesn't look like they have anywhere physical to check out or buy stock. New scarf. Any ideas how old it is? That is a classic 80's, and a beauty too. The problem is that it is too short to be of much use. Never mind, l don't need it because l have numerous cashmere jumpers/cardigans/polos in that colour, but l wanted a 1960's Pringle in my collection. 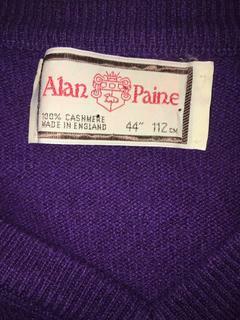 Hi gents, I've got an oldie made in Scotland Pringle 100% cashmere v-neck sweater in royal blue that I no longer want. Size 40, in very good condition with lots of life left. Send me a direct message if you'd like to give it a good home. Got some pics, and of the tag? Top to bottom is 25.5 in.